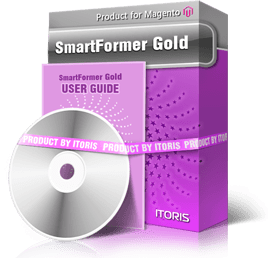 SmartFormer Gold for Magento is an advanced form builder. Now when you need a custom registration for your online store, or a brand new contact form, a feedback from your clients or additional requests for your products or services – there is no more need in plenty of Magneto extensions, SmartFormer Gold will deal with all these requests. Embedded email notification. You select who will receive emails when forms are submitted (users, admin or both) and create beautiful email templates in WYSIWYG editor. You also pull data users enter in form to these emails easily. Forms’ submissions in admin area. When your users fill in and submit forms – you will see all these submissions organized in the list, can even edit them and delete, can export all or selected ones. SmartFormer Gold Magneto form creator is convenient for any level of user, yet developers will find advanced tools to create complex form-based applications - in addition to set of draggable HTML elements, toolbox of snippets and configurable email templates the form builder provides embedded PHP, CSS, JS and HTML editors, Database Manager to change or customize the behavior of forms on the fly! If you need even more functionality you can also check our great plugins Digital Signature and Advanced PDF Templates developed specially for SmartFormer Gold. You will use the full WYSIWYG (what you see is what you get) for creating the forms - no arrows, no separate pages for each element - you have the area and you drag your elements there and drop them where you need it. You can easily move them with your mouse; there is the copy feature, bulk movement. Perhaps you will also need email notifications. When you create email templates - you will use the WYSIWYG in Magento, so it will be very similar to creating the CMS pages of your site. We provide free IToris Installer. Installation of any of our design template or extension including Smart Former Gold for Magento has never been as simple – you select it and press Install. When a new version is available you update your form builder with one click. You can clone your forms, which is very convenient if you need several similar forms. The cloned form will be fully independent. You can also back up the forms and upload them to another site. Smart Former Gold for Magento provides the advanced work with database. You can either create the new table for your form automatically, or manage it manually. Also there is the ability to write data from your forms to the existing tables of your DB. You can insert a form into a CMS page, into file’s layout or use form’s direct URL to bind it to a link or menu. Direct URL is a good way to check your form from the front-end before publishing it. After a form is submitted, administrators of the site can view the records. Sometimes these submissions need some correction - it can also be done from the back-end. Smart Former Gold also has a powerful filter for record in admin area. You can sort the submissions to display certain fields of the form to see only the submissions corresponding to a certain rule. Perhaps you will need to export the submitted data. SmartFormer Gold provides export option - to .csv file (later on you can open it with MS Excel). You select either to export all submissions, or some of them, check the ones for export and press the button - and your submitted data is exported. Security is such a widely-met problem when dealing with forms. To avoid spamming, Smart Former provides three variants of Captcha code. You select one of them and add it to your form. You can also make your Captcha re-loadable with no reloading of the rest of the form (if users can not read a Captcha - they reload the image, while the rest of their submitted data is kept). There is also front-end and back-end access control. You can limit the access to your forms, so that only the selected administrators can manage them. You can also limit the front-end access to certain groups of your users only. We have mentioned already you will create email templates in WYSIWYG. It will be very similar to the way you add new articles to your Magento site. Perhaps you will need to embed the data submitted by your users to the email sent to them and/or to administrators. It is very easy with Smart Former Gold - on the top of your email editor there is a drop down with all fields your form contains. So for example you select the field called "First name" and add it to the email template. When your users receive the email, they will see their own names in it. You can create separate email templates so that your administrators and users receive different emails. Smart Former Gold provides the unlimited number of templates. Your forms can contain the unlimited number of elements and unlimited number of pages. There is the list of HTML elements provided (for example input box, drop down, etc.). You can also copy-pase your element(s). Scripts can be associated with elements' properties expanding the functionality of your forms. When you need to make your form colorful or add images to it - no need to remember images' URLs or color codes. SmartFormer Gold for Magento provides beautiful visual color selector and image selector. You will see all thumbnails of images from your Media Manager and the folder structure will also be provided. Colors' samples are large, now you can select the color that you need easily. There are snippets - ready-made popular combinations of elements. You can add a snippet with one drag, thus populating your form with elements even faster. The snippets already have properties set, yet you can edit the properties if you need it. Smart Former Gold also has several convenient editing helpers. You can change the size of the grid when creating forms, so that aligning is fast and easy. To make it even easier there is the stick-effect created for you. When you add the following elements, they "stick" to the previous ones, drawing the temporary lines between elements. The elements of your form have the full list of MSDN properties, evens and attributes. The object finder is available in Smart Former Gold as well. User guide can be useful if you need detailed description of the element specifically per property, event, assigned database field or variables in email templates. User guide is intended for individuals who address forms on the professional level. User guide is available online and in the PDF file. If you are novice and apply consecutive development of your features and need some reference at hand to advise you can be armed with our Quick Start guide. It shows step by step how to create a simple form and publish it on the front end, how to bind it to the DB, create email notifications and manage submitted data. Quick Start guide is available online and as a downloadable file. This service is ideal for customers who create forms themselves and need technical consultations. If you believe you need professional consulting from us you can purchase a ticket and gain access to the support system. Paid support is limited in time so taking into account the frequency of your requests you can consider the period of 1, 3 or 6 months. To get detailed description of the support's scope please check Terms of support service. What if you do not have time or do not wish to create forms yourself? Not a problem!! Contact us and we will create any complex form you need fast and professionally. With this service you will save money as you need Lite Version of SmartFormer Gold. Receive your ready form by email, upload it from admin area and bind to your website. Simply describe your request – your form can include conditional branching, can hide and show elements, can send email notifications, can save submissions in admin area – anything. You need a custom registration, or a modified contact form? Or perhaps you want a form under each your product so that your clients can ask additional questions? Any form-based solution will be provided in a short time. Have questions or like this service? Contact us today.